The official result of Jakarta's gubernatorial election has been announced by the Jakarta General Elections Commission (KPU Jakarta) on September 29, 2012. The KPU Jakarta declared that Joko Widodo, popularly known as Jokowi, and his running mate Basuki Purnama Tjahaja, better known as Ahok won the election with 2,472,130 votes or 53.82% of the total votes. Jokowi and Ahok will be inaugurated as the new Jakarta Governor and Vice Governor on October 15, 2012. 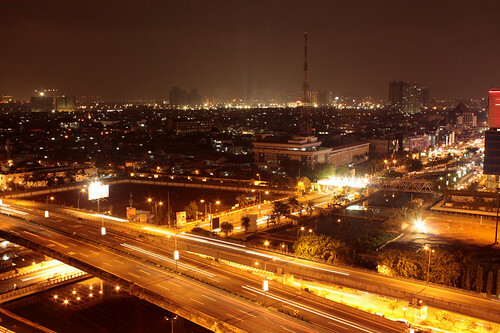 Jokowi will lead Jakarta in the next five years to build his vision of a "New Jakarta". What can we expect from his leadership about "New Jakarta" particularly on transportation? In reference to what Jokowi has said during his campaigning, we should expect a new and better approach in addressing many acute urban problems in Jakarta including traffic congestion, floods, slums areas, and street vending. I commend the mindset of Jokowi in addressing the most acute urban problem of Jakarta-- traffic congestion. He understands that the correct way of addressing traffic congestion is not building more roads, but developing mass transportation. He said during his campaign that "Move People, Not Cars" was the solution for the Jakarta's traffic congestion. Jokowi made pledges to expand the routes and the modes of Transjakarta Busway. He observed that the current mode of Transjakarta could only carry 40 passengers and caused a long delay during peak hours. He suggested that buses be replaced by rail-buses which can carry 300-400 passengers. He promised to continue the development of monorail and expedite the development of the Mass Rapid Transit (MRT) or also popularly known as Metro. He would also encourage the use of private cars by imposing electronic road pricing (ERP) and increasing parking fees. Unlike the Governor Bowo administration, Jokowi openly opposes the development of six elevated toll roads in Jakarta. He argued that the development of elevated toll roads would not disentangle Jakarta's chronic traffic snarls. The development of elevated toll roads will promote the uses of private cars and make the acute Jakarta's traffic congestion even worse. He argued that the budget of 40 trillion rupiahs could be used to develop a more integrated, accessible and affordable mass transportation system in Jakarta. In addition, Jokowi proposed low-income apartments in and surrounding commercial areas. He would like to develop integrated residential areas (permukiman terpadu) in which workers of commercial areas will live and commute every day to their workplaces in very short distances. Such residential areas will significantly reduce the commuting trips generated by employees in Jakarta. It is clear that Jokowi understands the roots of Jakarta's chronic traffic congestion. He will promote the mass transportation system and discourage the uses of private cars. His campaign slogan of "Move People, Not Cars" is the mindset that Jakarta residents need to follow for addressing the acute Jakarta's traffic congestion. I would also encourage Jakarta residents to implement as many ways as possible to alleviate traffic congestion including shuttle services, carpool matching services, and telecommuting. Jakarta residents should encourage their employers to expand their shuttle services and develop carpool matching services for their employees.Telecommuting is another way to reduce commuting by using telecommunication technologies. Employees can work outside the traditional office at remote work locations including their homes. A study in the US showed that telecommuting can reduce commuting by 10.4 percent of the labor force (Cullingworth and Caves 2009). Making plans is simple, but implementing and executing plans require a lot of efforts and cooperation from all stakeholders. We have good plans to address the Jakarta traffic jams and Governor Jokowi will lead the efforts to implement and execute the plans. All plans of addressing the Jakarta traffic jams will succeed only if Jakarta residents support them. Without the support from Jakarta residents, all excellent plans will become useless. Funny, the railed buses reintroduced after the independence. I think Jakarta indeed needs a more extensive public transport system. But the system cannot go on ground level, it must be elevated or dug down. Because otherwise it will compete with cars and motors for the sparse space on the roads. For the car problem, the solution is replacing the CBD in the greater Jakarta region. Commuting traffic from the middle class doesnt have to get through the city centre. The place where now is the CBD needs to be filled with an new old city centre like amsterdam or london. housing and shops are mixed. And more important ONLY bycicle traffic and pedestrians allowed. So there you have it, a vivid city centre without a car problem and extensive public transport.